The answers to common questions motorists ask about road cycling. Savvy Cyclists drive in the middle of the lane because it actually protects us against the most common motorist-caused crashes. Our top safety priority is to ensure vantage and visibility (to see and be seen). 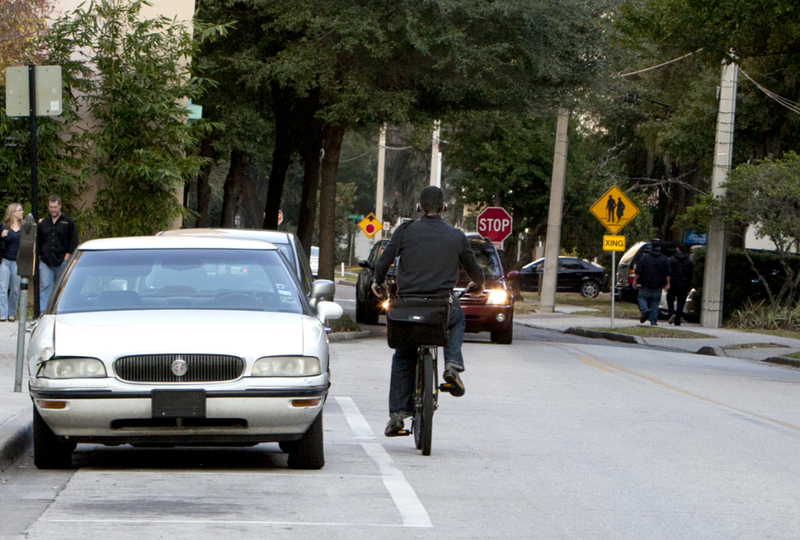 Bicycling in the middle of a lane is our #1 tool for defensive driving. The 5 most common crashes involving law-abiding bicyclists on the roadway can be avoided by the bicyclist riding farther left. These crashes are caused by motorist error, and would legally be the fault of the motorist regardless of where on the road the bicyclist was positioned. Drivers of narrow vehicles, such as motorcycles, scooters and bicycles do not occupy the lane by default. Their vehicles only occupy a fraction of the lane width. Since bicyclists are both narrower and slower than most traffic, other drivers expect to be able to use that extra lane width when passing. The problem is, many drivers misjudge the amount of space needed to provide a safe (and legal) buffer. So, when a bicyclist knows there is not enough space for motorists to pass safely within the lane, she moves into a lane control position to indicate that faster traffic must change lanes to pass. When a car door is opened into the path of a bicyclist, the results can be deadly. Motorists are required to look before opening a door into the street. But people get distracted and forget. Bicyclists have 100% control over preventing this type of crash by riding 5 feet or more from parked cars. Motorists sometimes pass a cyclist just before making a right turn. They misjudge the speed and distance needed to pass, or they just don’t register the cyclist’s presence. By riding far enough left to require a lane change, the cyclist encourages drivers to wait and turn after the cyclist has cleared the intersection. When cyclists ride on the edge, they are often screened by passing cars. This hides them from view of motorists waiting to turn left. 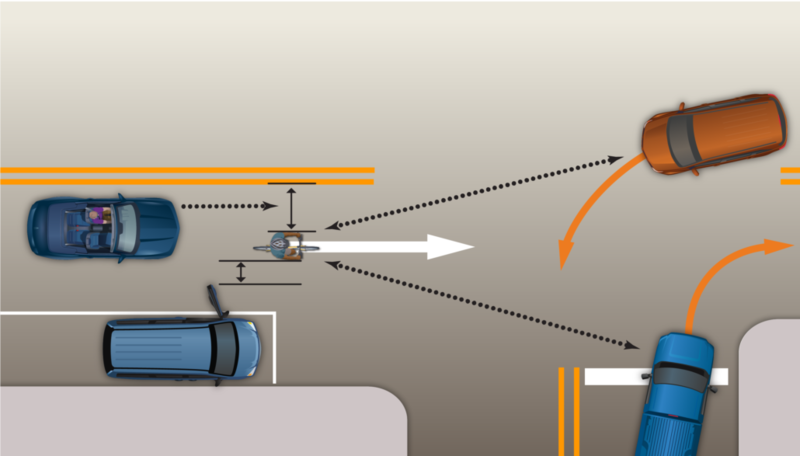 By moving left and seeking vantage to see and be seen, cyclists can usually discourage the left turn violation, or at least have space to perform an avoidance maneuver. Motorcyclists do this, too. The edge of the road is often invisible to motorists waiting at side streets. Buildings, shrubs, poles and other obstructions can hid a cyclist who is riding too far right. 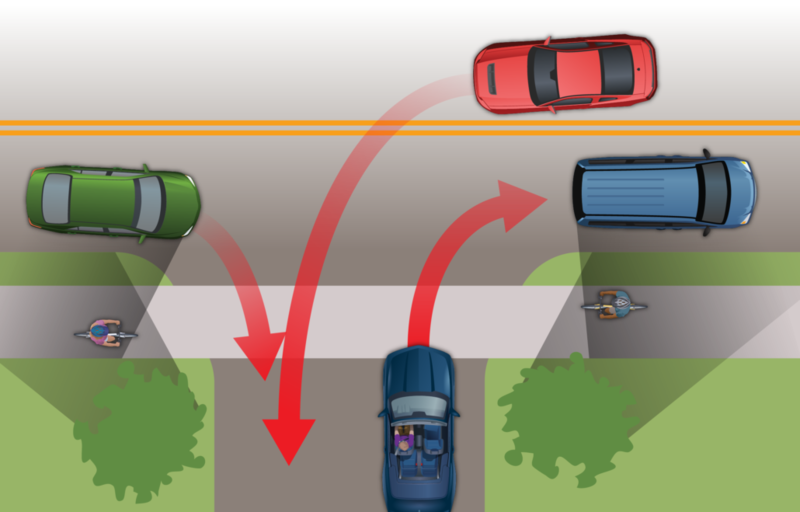 Just as motorcyclists are taught, we teach cyclists to ride where you can see the driver of a car waiting to pull out. 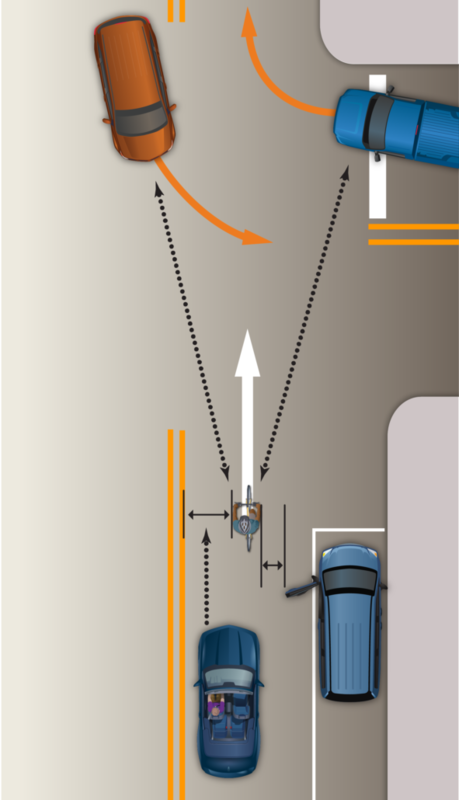 Keeping to the right can often hide a bicyclist from a turning motorist at the critical time and place. Most overtaking crashes involve a motorist who attempts to squeeze past (illegally) in a lane that is too narrow to share. Check out this animation to see all the hazards that make staying far right NOT practicable! 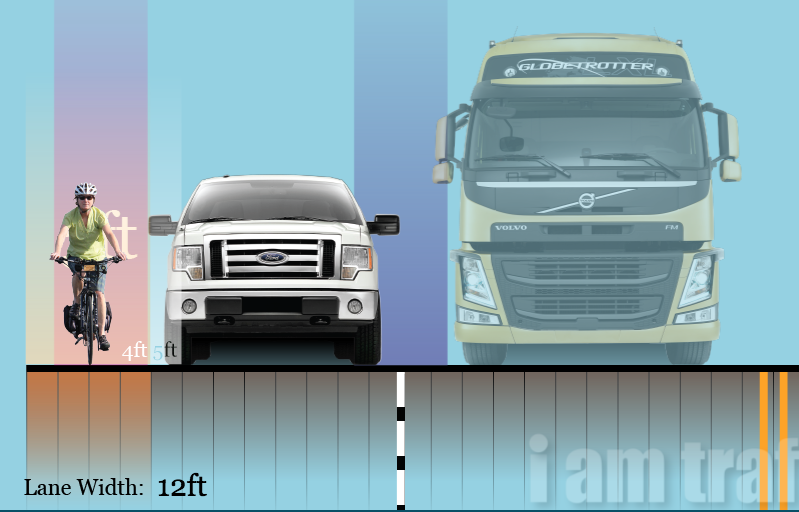 Click the image above to explore our interactive lane width diagram. When approaching intersections, or in areas with lots of driveways, a bike lane puts us in a conflict zone. Bike lanes increase our risk for all of the common crossing and turning crashes by making us irrelevant, or even invisible to motorists. That may not even be a bike lane. It has become popular to add edge lines several feet to the left of the curb. This space is substandard and not safe for a bicyclist to use, though many bicyclists are tricked into riding there. Even in states with mandatory bike lane use, the law allows cyclists the same exceptions as it does to keeping right in general. While biking on the sidewalk would eliminate the very rare overtaking crash, it would increase the bicyclist’s risk for the far more common right hook, left cross, and drive-out crashes. Sidewalks present many more blind spots and physical hazards than roadways do. Cyclists on the sidewalk can be hidden from your view by shrubs, poles, boxes, and other obstructions, as well as by passing cars on the road. Aside from that, the sidewalk is simply not in your primary focus area when you are negotiating with traffic on the road. You’re more likely to crash into a cyclist who is on the sidewalk. It’s also likely you would be at fault in that crash. All road users routinely and legally delay other road users. “Impeding” is when a driver delays others in a particular way that has been defined by the state to be unlawful. A motorist waiting to make a left turn from a two-lane street will delay motorists behind him. Buses stop to pick up and drop off passengers. Pedestrians in crosswalks delay motorists who are required to yield to them. Convenience must take a back seat to safety. In our training courses we teach cyclists how to minimize the delay they might cause to other road users, while still driving in the safest possible manner. It’s rare for a bicyclist to cause more than 30 seconds of delay to passing motorists. On the other hand, traffic lights are often as long as 120 seconds. And delay from rush hour traffic jams like the one on the right can be measured in minutes or hours. There are no bicyclists on that road! Every state except Nebraska and Hawaii allows bicyclists to travel two-abreast, provided doing so does not impede other traffic. On streets where the lane is not wide enough the share, a solo bicyclist is allowed to ride in the middle of the lane anyway, so the presence of another bicyclist to her right is of little consequence. Ah, where to begin… First, most bicyclists own and drive motor vehicles, buy gasoline for them, and therefore pay gas taxes. We all also pay gas taxes indirectly when we pay for other goods and services; businesses pass along the costs of shipping and travel to customers. Many other taxes contribute to the construction and maintenance of public roads, including property taxes, sales taxes, impact fees, and more. Much of the gas tax is used to widen roads to accommodate more and more cars. Many other taxes contribute to the construction and maintenance of public roads, including property taxes, sales taxes, impact fees, and more. Even bicyclists who don’t own cars pay way more than their share. As with gas taxes, most do. But the reason people are required to be licensed to drive a motor vehicle is because they are inherently dangerous devices which pose a great danger to others. 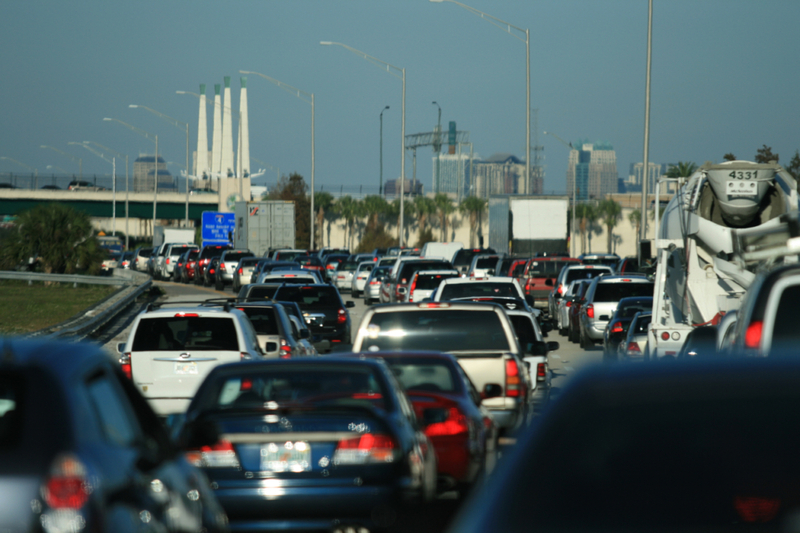 Motor vehicle drivers kill over 35,000 and injure over 2 million people a year in the United States. Careless or reckless motorists endanger everyone, while careless or reckless bicyclists are mostly a danger to themselves. For a deeper dive into bicycle licensing, read this article. 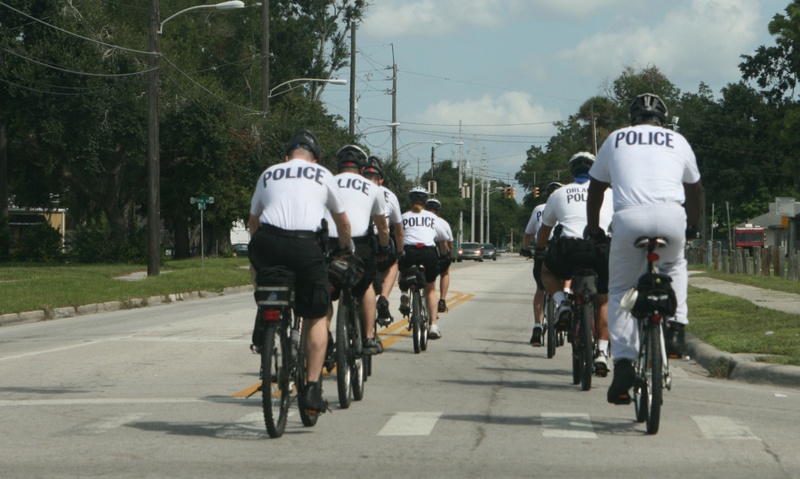 We encourage and train bicyclists to drive their vehicles in the safest legal manner. It is much easier and less stressful to follow the rules of the road than to flout them. We recognize many bicyclists violate the law. Some don’t know better. They simply don’t know that the rules of the road are for everyone, including them. Some do it because they believe the system is inherently unfair. They’re not entirely wrong. Whatever the reason, no bicyclist is responsible for the behavior of another bicyclist. No bicyclist should have her rights or safety jeopardized as punishment for the behavior of other bicyclists. Please remember, biking in the center of the lane is not illegal. 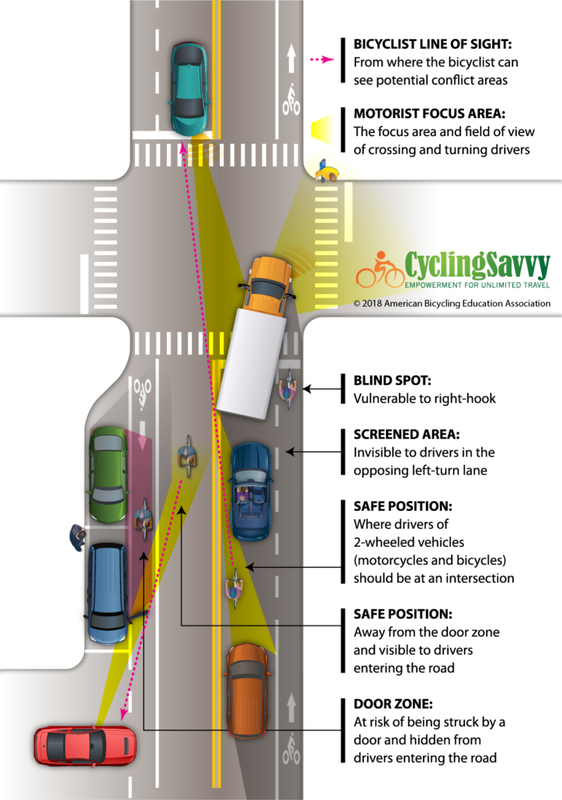 In most circumstances, the bicyclist operating in this manner is one who has learned the rules of the road, and the best practices for safe and cooperative bicycling.